Is it weird that I’m making carrot cake in November? Probably, but trust me. No one will complain! 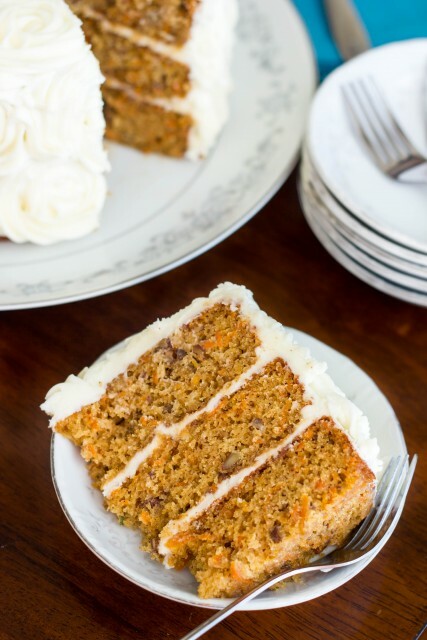 This is my favorite carrot cake EVER! Yes. EVER! 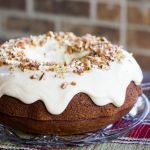 I prefer my carrot cake without raisins, coconut, or pineapple, because I feel like carrot cake with too many additions starts becoming a cross between Italian Cream Cake, Hummingbird Cake, Spice Cake, and carrot cake (obviously ha!). Which are all delicious, don’t get me wrong, but aren’t carrot cake. 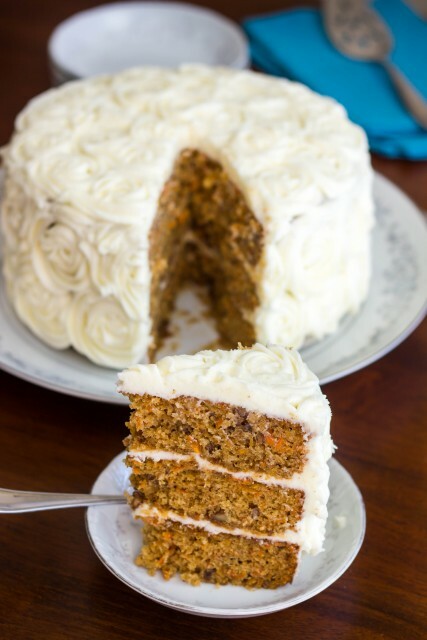 My carrot cake uses a combination of applesauce and oil to keep it super moist. 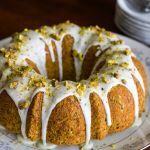 It’s got just the right amount of spices, while the toasted pecans add some texture and keep it interesting. Best of all, the cake to frosting ratio is out of control! So much frosting!! Cream cheese frosting is the best. Am I right?? This cake definitely feeds a crowd, so invite all your friends over. And if cake decorating isn’t your thing, you can easily skip the piping and spread the frosting on with a spatula. It tastes just as good ;). Enjoy! 1. Preheat oven to 350 degrees. Spray 3 (8 inch) cake pans with nonstick spray and line bottoms with parchment paper. Set aside. 2. In large bowl, whisk together sugars, eggs, oil, applesauce, and vanilla until smooth. In separate bowl, whisk together flour, baking powder, baking soda, salt, cinnamon, ginger, nutmeg, and cloves. Add to wet ingredients and mix until combined. Stir in carrots and pecans. 4. Cool in pans on wire rack for 10 minutes. Then turn out onto wire rack to cool completely. 5. When cakes are cool, prepare the frosting. In bowl of stand mixer with paddle attachment, beat butter and cream cheese until smooth. Gradually mix in powdered sugar 1 cup at a time. Beat on medium speed until smooth. 6. Add in vanilla and 1 tbsp whipping cream. Beat another 30 seconds – 1 minute or until light and fluffy. Add an additional tablespoon cream if necessary. 7. Place on layer of the cakes on desired serving tray. Top with ~1/2 cup of frosting. Repeat with remaining layer. Apply thin coat of frosting to top and sides. Place cake in fridge to chill for about 30 minutes or until frosting is slightly firmer. Using 1M piping tip, make roses over entire cake. (Or simply spread top and sides generously with frosting using a spatula or knife.) 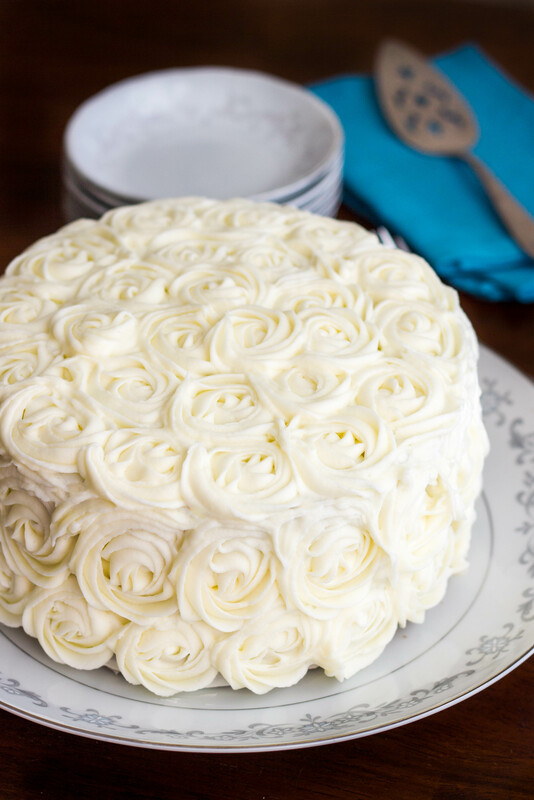 If you choose not to make a rose cake, you may have some frosting leftover. 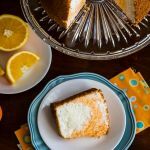 Cake will slice better when cold (straight out of the fridge), but I prefer to serve it when it’s room temperature or almost room temperature. Kendra, your cake is great. 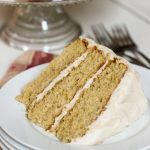 I would love you to stop by Food on Friday: Cakes over at Carole’s Chatter to add this to the cake collection! Cheers! Thanks! I linked up =).